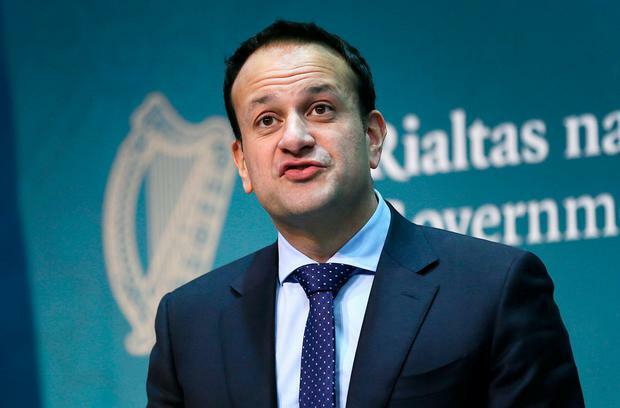 Leo Varadkar says he can still follow through on his commitment to dramatically increase the entry point for the top rate of tax without breaching the terms of the confidence and supply agreement. The Taoiseach has pledged to increase the entry point for the 40pc income tax rate to €50,000 over the next five years. However, he is bound by the agreement with Fianna Fail which insists on a 2:1 ratio in favour of spending over tax cuts in every budget. Mr Varadkar also said Independent ministers would have a “huge role” in future budget negotiations and Fianna Fail would have “influence” over the final decision taken by the Government next October. “It’s not that anybody gets their entire way in a budget, but as a party, Fine Gael will absolutely be arguing for Middle Ireland, for working people, for people on average and above-average incomes who pay the highest rate of tax far too soon,” he added. Fianna Fail finance spokesman Michael McGrath responded saying it was “way too early” to discuss the next budget when the country was preparing for the untold consequences of Britain’s decision to leave the European Union next March. “It is premature and presumptuous for the Taoiseach to be speaking at this point about tax cuts given how much is at stake from the outcome of Brexit,” Mr McGrath told the Sunday Independent. “Fianna Fail will make its own assessment closer to the Budget as to what we think are the right mix of policies to protect citizens and the economy,” he added. The Irish Fiscal Advisory Council said the recent Budget unveiled by Finance Minister Paschal Donohoe left the country exposed to “adverse shocks”. The council was concerned Mr Donohoe was not preparing for the next economic downturn and was putting too much resources into public spending and tax cuts. The Economic and Social Research Institute (ESRI) said the Budget impacted unfairly on lower-income households because income-tax credits were not increased. The Taoiseach announced plans to introduce a tax cut worth €3,000 to average workers at Fine Gael’s recent Ard Fheis. The plan involves increasing the top-rate entry point to €50,000 for a single person, or €100,000 for a two-income couple. The proposal would cost almost €3bn to fund. From January 1, the 40pc rate of income tax will kick in at €35,300 next year. The commitment was made before Fianna Fail leader Micheal Martin committed to extending the confidence and supply agreement by a year, citing the uncertainty surrounding Brexit as the reason behind his decision. Mr Martin publicly told Mr Varadkar to “cool the jets” when he announced his tax cut pledge in November. The Fianna Fail leader noted Fine Gael previously promised to abolish the Universal Social Charge and to introduce US-style tax cuts.